A few squirts of a homemade citrus solution can be used as part of your arsenal to keep cats and dogs away from areas where you don’t want them. Our cats and dogs – the most common pets we own – have a sense of smell that is far more sensitive than we humans possess. Some dogs, especially male dogs, have a strong drive to mark their territory with urine, and then have a further tendency to repeat the process where they have done it before. Smaller male dogs are the most likely of all to repeat this process in the home. Most cats are not as likely to have this problem, but all cats and dogs are not created equal and you might own the exception to the rule. We humans follow the mess with a good cleaning, and think we have removed the odor. As far as our weak sense of smell is concerned, we were successful. But to our cats and dogs, the odor is still there. There are several scents that can repel most cats and dogs. Among them are ammonia, vinegar and peppers (both cayenne and red). All of them can be effective. The dilemma for humans is living with the odors we are using to try and prevent the pet urine odor. Obviously, ammonia, vinegar and peppers can be unpleasant odors in the house if overly used. Few of us would want to spread ammonia or cayenne pepper on the sofa. On the other hand, most of us find citrus smells pleasing. That’s why you find a lemon scent added to so many over-the-counter cleaning products. If you are trying to prevent a repeat performance in an area, clean the spot or spots first with a store-bought cleaner. We have recommended Nature’s Miracle Stain and Odor Remover in the past. It is an effective carpet and upholstery cleaner and is designed to treat pet urine stains. If you are trying to prevent urinations outdoors, you can use lemon peels or straight lemon juice. Indoors, you will want to dilute it. Use about one part lemon juice to three parts water in a spray bottle and test. You can also buy citrus oils, but these are stronger than juice. Add a two or three drops to a glass (about 8 oz.) of water to dilute and then test before using. Orange juice can work also, but is more expensive. To discourage a reoccurrence, a citrus treatment can successfully repel most cats and dogs from an area. There are two quick tests you can use to make sure the solution works. 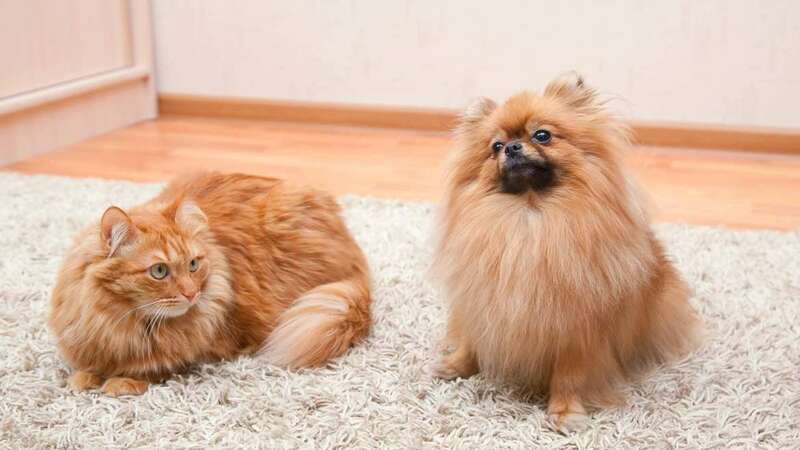 To determine if your pet is actually repelled by the solution, spray some on your hands and then try to stroke or handle your pet in a way your normally would. If he or she is repelled, success! If the pet licks your hands, the animal is an outlier and you need to find another solution. Also, you should test your solution for staining on a small patch of carpet or furniture in an area that is not visible.